As France gears up for a ninth consecutive weekend of Yellow Vest protests, the number of low-wage workers applying for a subsidy known as the "prime d'activité" has skyrocketed. This after the government expanded eligibility for it in a concession to protesters. Plus, Amazon has launched a new, ad-supported streaming service through its subsidiary, on top of its subscription-based Prime Video service. For the 23rd consecutive weekend, "yellow vest" protesters marched in central Paris on Saturday. According to CNN, riot police unleashed tear gas at the protesters. The protesters are rallying against economic injustice. Their demonstrations have frequently become violent. The government had warned that police would use "all means necessary" to stop demonstrations from getting out of control. French Interior Minister Christophe Castaner said more than 60,000 police were deployed across France to deal with the protests. French tourism hit a new record in 2018 in spite of violent Yellow Vest protests at the end of the year. Also today: the US and China agree on an enforcement mechanism for an eventual trade deal, and the OECD warns that the developed world's middle class is in trouble as the super-rich hoard the gains of growth. 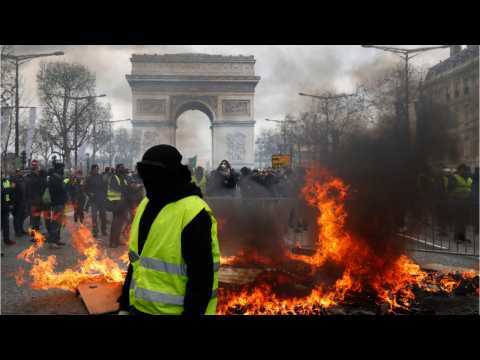 According to a report by Reuters, on Saturday, police and demonstrators clashed briefly in Paris and other French cities as 'yellow vest' protests against President Emmanuel Macron's government continued for the 19th consecutive week. 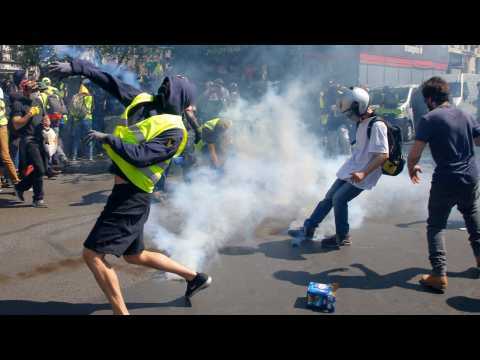 The demonstrations reportedly remained peaceful for most of the day, however later in the afternoon, police fired tear gas on protesters near boulevard de Strasbourg, near the capital's Gare du Nord and Gare de L'Est railway stations. Reuters reports that skirmishes also erupted in other cities around the country, including Lille in northern France, and Toulouse and Montpellier in the south. According to a report by Reuters, on Saturday, French police fired tear gas to disperse protestors in Paris, Lyon and Bordeaux, as the 14th consecutive week of 'yellow vest' protests took a violent turn in the afternoon. Four people were injured in Rouen after a driver tried to force his way through a crowd of protestors. Demonstrators gathered peacefully at the Arc de Triomphe earlier in the day, before marching toward the Eiffel Tower.